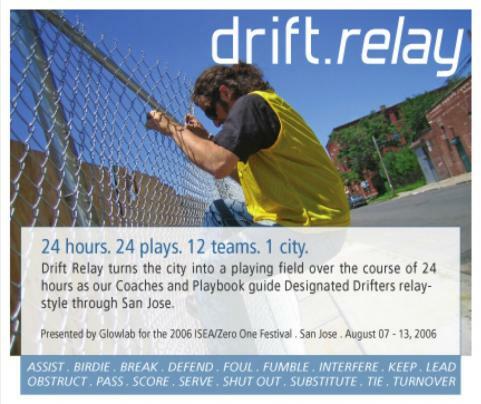 The Drift Relay was a collaborative psychogeographic experience in the form of a 24 hour exploration of San Jose. Participants drifted through new and familiar city spaces with a Glowlab coach and a mobile kit of recording tools, contributing to a collective journey of endurance and discovery. Images from camera phones, audio from voice calls, and location via geocoded addresses sent by SMS documented the experience. The live website continually broadcast the remote group's location and status and display captured materials in real time throughout the duration of the Drift. Taking the phrase "the city that never sleeps" to heart, participants located the joys and difficulties of documenting ephemeral urban experience. The ZeroOne San Jose: A Global Festival of Art on the Edge & the Thirteenth International Symposium of Electronic Art (ISEA2006) was held from AUGUST 7-13, 2006 in San Jose, CA. Drift Relay was created by a group of nine artists working as Glowlab. 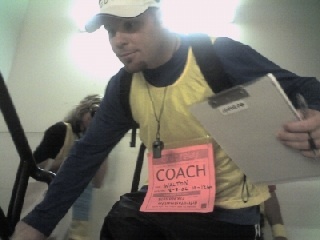 Each drift had a coach who led us through drifting exercises. 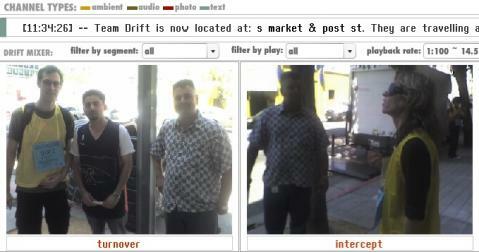 The project website was continually updated as to location & activities of the drifting group. We managed to do water acrobatics while appearing to be guests of the hotel.